Torus is filled with complexities: bayonets, text on ribs, gears, bump-offs, clip cams and more. We created the free design aid to illustrate that just because we manufacture parts really fast, it doesn't mean you're limited to certain features in the geometry of your part. Torus has a trio of interconnected sections, each highlighting features that serve various purposes in part design. Register to receive a free Torus design aid. The U.S. Army is looking at helmet prototypes with optional parts to protect the face and jaw from various threats, including blast waves. But, as Dr. David Mott -- an aerospace engineer at the U.S. Naval Research Laboratory -- says, more parts lead to more surprises. Siemens has developed the SIPLACE X Series with the purpose of providing electronics manufacturers worldwide with a more cost-effective solution for printed circuit board (PCB) assembly. The head of the 20-segment Collect and Place unit includes 20 pipettes, each with their own compact brushless DC motor to maximize output and precision without sacrificing speed or the light-weight design. Using Stratasys additive manufacturing technology, Volvo Trucks has reduced turnaround times on certain clamps, jigs, and supports from 36 days to just two days -- and gained many other manufacturing advantages. 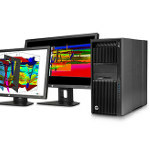 Built for high-end computing and visualization, the new HP Z840 workstation delivers outstanding performance in one of the industry's most expandable chassis. The HP Z840 allows you to get the performance you need with the ability to support two next-generation Intel Xeon processors for up to 36 total processor cores in one system. This 1-TB unit also boasts the latest graphics cards from Nvidia and AMD, and fast DDR4 RAM. Manufacturing researchers at the National Institute of Standards and Technology (NIST) have scoped out the missing sections in current guidelines for powder bed fusion, the chief method for "printing" metal parts. The new NIST report identifies key unknowns that must be solved before the technique -- one of the most promising and versatile of the additive manufacturing processes -- can progress from largely a "trial-and-error" method to one that can be fine-tuned automatically. Stock Drive Products (SDP) has introduced the new Miniature Synchronous Drive System so you can put your own 1-, 2-, or 3-mm design together in a snap. 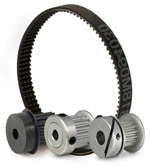 The tiny timing belts and pulleys are engineered and manufactured to give high accuracy and smooth, dependable operation in 3D printers, moving security cameras, med devices, robotic surgical equipment, self-service machines, and more. Advantages include no-slip synchronization, accurate positioning, high torque transmission with low backlash, quiet operation, and long belt life. Engineered to be the perfect choice for LED strip light applications, the new GCT BJ300 and 301 mating connector combinations offer a reliable dual-contact design. LED strip applications are usually low cost, consisting of small panels of LED lights clustered on PCBs. The PCBs snap together in co-planar orientation. 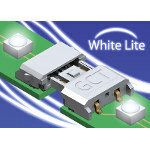 GCT White Lite connectors fit perfectly with these applications, because they're economically priced and fit onto small and thin PCBs. Mated connector height is 2.6 mm, with a total mated footprint of 8.80 mm (width) x 11.00 mm (depth). Daimler Trucks North America's SuperTruck program has achieved 115 percent freight efficiency improvement -- surpassing the Department of Energy (DOE) program's goal of 50% improvement and exhibiting the best results of all reporting OEMs. The SuperTruck was unveiled on March 25 at the 2015 Mid-America Trucking Show. This April marks the 50th Anniversary of Moore's Law. Three years before co-founding Intel, Gordon Moore made a simple observation (in a trade magazine!) that has revolutionized the computing industry. It states that the number of transistors -- the fundamental building blocks of the microprocessor and the digital age -- incorporated on a computer chip will double every two years, resulting in increased computing power and devices that are faster, smaller, and lower cost.